Once again, guests had the opportunity to shop an array of vendors as they got a glimpse of the hottest new trends and accessories at the Accessory Showcase. Also, guests were treated to chain-link bracelets courtesy of D’Andrea by Nicole D'Andrea, as each bracelet was made with materials from their handbag collection. 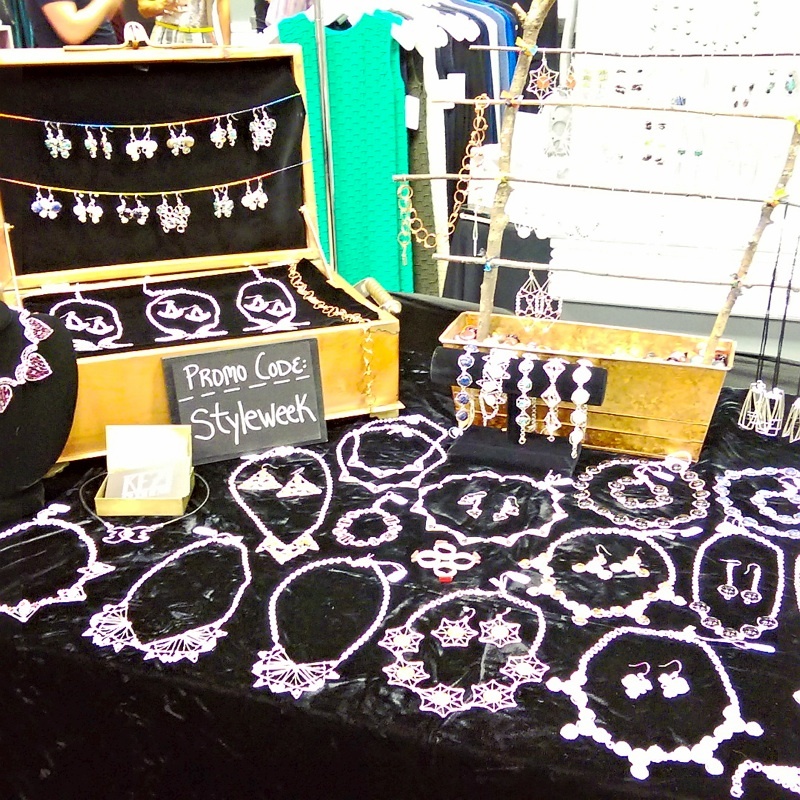 One of the wonderful vendors was Olivia Ashjian James, owner and designer of Kezi. Taking inspiration from the soul, Kezi designs take woven wire and create a path to life’s inspirations. As a result, Olivia is inspired by nature and the world she sees around her. As a self-taught designer, Olivia original background is in sculpting and painting, but soon discovered she could better pass on the beauty and harmony she saw through jewelry-making. In addition, Olivia's grandfather was once in charge of constructing the historic street lamps in the Boston’s Beacon Hill neighborhood. Therefore, as Olivia proclaims, “it was just naturally ingrained in me to work with metals”. The night began with Stetkiewicz by Amy Stetkiewicz Spring ’16 collection. Models were seen in designs featuring an aesthetic mix of minimalism and edginess that made you wish summer was just beginning. Inspired by “all things modern”, Stetkiewicz’s collection vitalized a downtown-chic vibe with its perfectly constructed raw-edging and clean lines in laid-back, luxurious fabrics. Next up was Providence-based designer, Jess Abernethy, who's collection was the epitome of the past meeting the present, as models were set down the runaway in a colorful array of “fifties housewife meets modern day hipster” garments. Showcasing the sophistication of her collection, full and pencil skirts, cropped pants, and high-waisted shorts graced the runway. Moreover, Jess emphasized the playful side of the collection by accessorizing each garment with pastel tennis rackets and croquet sticks that showcased the sophistication of her collection. Closing out the show was none-other –than Project Runway Season 7 star, Jonathan Joseph Peters. This collection was all about the details with accessories and jewelry by House of Cach. Set to the theme of Villainous Vixens, models took on a ravenous and vivacious persona while unveiling a collection that was the perfect combination of avant-garde with ready to wear. As StyleWeek has come to a close, founder and CEO Rosanna Ortiz, once again did not disappoint. In an interview, Rosanna explained the mission of StyleWeek Northeast is “to connect the community with emerging, local designers; while creating a driver for the economy” and it seems that concept will continue to ring true for many more seasons to come.